Would You Live On This Island Paradise In Norway? I was a little nervous about staying with Rob’s friends, Kjartan and Ingeborg, after the two of us finished our bike ride across Norway together. Kjartan and Ingeborg had graciously offered to host both Rob and I after our tour was over – not just for one night, but for several… and I was afraid I might be overstaying my welcome. But Kjartan and Ingeborg (and their entire family) were incredible hosts, who not only let us sleep at their home for several nights, but also hosted Rob’s girlfriend Carey and my friend Katelyn as well. At some point during my stay with Kjartan and Ingeborg, they began to ask about my travel plans once my bike tour with Katelyn was over, and I explained that the plan was to spend the next month just randomly cycling around Norway and Sweden – but that I’d have to be in Umea, Sweden on the 15th of September in time for my flight back to the United States. 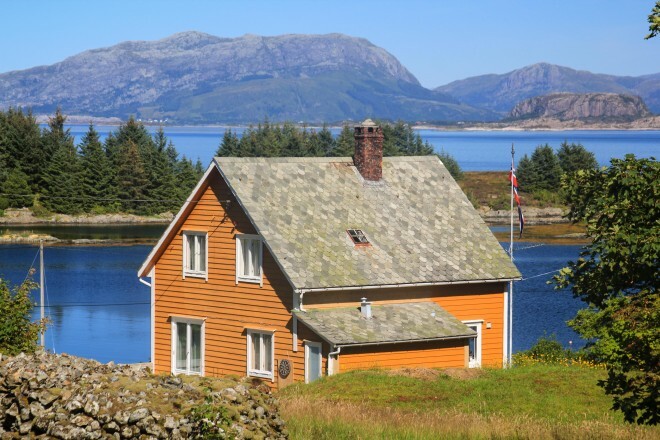 It was around this time that Kjartan and Ingeborg mentioned that they had a summer house located on an island a few hundred kilometers north of Bergen, and that if I wanted, I could go and stay there for a while. At first I thought, “Wow! That’s amazing. But there’s no way I can accept such a gracious offer.” But the more I thought about it, the more I saw their offer as one incredible opportunity. After all, when was the last time someone offered you a free place to stay on an island in Norway? Isn’t it the dream of so many to live on a deserted island… at least for a little while? And so, after just one night of thinking about, I told Kjartan and Ingeborg that I’d like to take them up on their offer and stay in their summer home for about two-and-a-half weeks. This would require than I change my plans for cycling across Norway and Sweden just a little, but I was okay with that. I would trade one opportunity (biking across Scandinavia) for an even more unique opportunity (living in a house, all alone, on an island in Norway). So, after my bike tour with Katelyn was over, Kjartan and I drove Katelyn to the airport for her flight back home… and then Kjartan and I drove for several hours to the north, before taking a ferry over to the island, driving for another half hour, and then finally arriving at the place that would be my home for the next two-and-a-half weeks. When Kjartan and Ingeborg were telling me about their island home, I thought it might be a little tiny cabin on the edge of the water. But when I got to the house, I realized it was a whole lot bigger than I had imagined. It was incredible! The yellow main house was three stories tall; with a basement on the ground floor; the living room, dining room, kitchen and bathroom on the first floor; and four small bedrooms on the second story. Kjartan said I could use one of the bedrooms upstairs, but I spent most of my time in either the kitchen or the living room, where I spent hours working on my computer and catching up on all the projects I had been unable to do while I traveling across Denmark, Sweden and Norway on my bicycle. In addition to the main house, there were a number of small outbuildings nearby. There was a wood-cutting and wood-storage building and a large boat house down by the water. The house, after all, was located just steps from the water on a small, picturesque bay – with views of mountains, water and fjords in the distance. Kjartan stayed at the house with me for just a couple hours before he jumped back in his car and drove back to Bergen. When he left me standing there at the front of the house, all alone, it felt really strange – like I was being left alone on a small deserted island. Would I be able to survive? The first night in the house was a little scary. Once it got dark, it got extremely dark. Everything outside the house was completely pitch black and weird creaking noises made me wonder who or what else might be in or around the house. But as the days went by, I became more comfortable there and as I continued to explore the house and the island itself, I really began to feel quite at home. During my first full day on the island, I rode my bike up the road a short distance (about 2 km), hid my bicycle behind a large rock, and then hiked on foot up to the top of a large mountain overlooking the western-most point of the island. From there, I could see the little yellow house where I was staying and all of their neighboring houses. I was also treated with a spectacular view of the surrounding landscape – mountains, ocean, fjords and more! It was a truly incredible view – one that isn’t really captured here in any of the photos I managed to take. I thought that being all alone on an island would make the time pass slowly. I thought I might even get bored being there all alone by myself. But life on the island wasn’t like that at all. In fact, I kept extremely busy and the days passed far too quickly. Almost every single day I’d walk, run or bike away from the island on the road leading from the house where I was staying to the ferry landing on the other side of the island. Then, somewhere along the road, I’d cut off into the rocks and bushes to my side and continue climbing off into some more remote part of the island. There were hundreds of small, beautiful places to explore. In fact, I was there for two-and-a-half weeks and I only saw a small fraction of what the island had to offer. Every day I’d go out and explore the island, sometimes taking photos and sometimes leaving my camera back at the house. If the sun was out, the island would look green and lush. The sky would be bursting with colors and the place would look like an iconic island paradise. On other days, dark rain clouds would cover the entire sky, turning the island gray. I stayed inside on many of these days, opting to work on my computer and stay dry, rather than venture out into the storm and get wet. But there were a few days when I went running or hiking in the rain, and the scenery was just as spectacular then as on any other day. Hiking across the island I came across dozens of large spiders building webs across areas where tiny bugs might fly. I also saw a number of grazing sheep and even a small sea otter, which ran out in front of my bicycle one day. It ran in front of me for about 10 meters and then darted off into a small creek on the side of the road. The most amazing thing about seeing that sea otter was that he wasn’t anywhere near the sea. He was actually about 1 km inland, high up on the road, but in an area with a small pond (where I imagined he was living). Most people don’t know this, but I actually started bicycle touring because I used to be a big runner. I was the first person from my high school to run four years of varsity track and it was the movie Forrest Gump that first encouraged me to consider running (not biking) across the United States. While most people know me as the “Bicycle Touring Pro” I actually enjoy running quite a lot, but I haven’t done much of it lately because I’ve been doing so much biking. But here on the island in western Norway, I found that I had the perfect road to run on. It was quiet, beautiful and almost entirely car-free. So I spent several days on the island running – both on the road and on some of the rocky terrain that covered the island. One day, I ran 12 kilometers in the rain to a nearby village and back. I was soaking wet when I arrived back at the house, but I wasn’t at all out of breathe. My calves were a bit sore, but I could have easily kept going. That run made me realize I’m in a lot better shape than I sometimes know. Before I left the island I wanted to get some photos of me on my bicycle, so one day I loaded up my touring bike and pedaled down the road a short distance. I had spent several days hiking to the top of the nearby “mountains” and I thought it would be amazing if I could get my loaded touring bicycle up there so I could take some photos. What I didn’t realize, however, was how difficult it was going to be to push and carry my heavy touring bicycle up that steep and difficult terrain. There were several parts where I had to jump over small streams or carry the bike down a sharp, dangerous ledge. My feet got soaked in the wet, swamp-like terrain, and by the time I got the bike up to the top of the hill, I was near exhaustion. Once I got my bike up there, I realized how difficult it was going to be to get a photo of my actually riding my bicycle in that terrain. I set my camera on my tripod and set up the 10-second time, which I use to take most of my photos. But running across the rocks, getting on my bike, riding it in front of the camera, and doing all of this in the allotted time was extremely difficult. Not only was it difficult to take photos of me riding my bicycle on the island, but it also made me wish I had someone there with me – someone to actually hold the camera, focus the lens, and position the photo for the best possible shot. You can only do so much when you’re alone and working from a tripod. I did manage to get a few photos of me riding my fully-loaded touring bicycle on the top of the rocky terrain that covers my remote island paradise in western Norway, but I don’t think I was able to truly capture just how spectacular this place really is. During my last night on the island I walked from the house, just a short distance up the road, and then climbed some rocks to get a better view of my village and the surrounding landscape. I timed my climb to the top of the rocks just perfectly, because once I arrived there the sun began to set and I was treated to a spectacular view of my little island paradise. Packing up my things and leaving the island wasn’t easy. And it wasn’t easy because I had fallen in love with the place. I’ve often dreamed about owning a house like that… and living in a remote/beautiful place like that… and I realized after 2.5 weeks of living there just how special this place is. I also knew that it was very unlikely I would ever be back. So, as the sun set that night, I tried to capture the essence of the place and soak it all in. The following morning, I woke up early, packed up my bicycle, shut off the water to the house, locked the front door, and pedaled away from my island paradise in Norway. I cycled up the road I had spent so much time walking, running and biking on… and at a certain point, I cycled past the area I was familiar with. With the house now far behind me, I continued cycling east… and I didn’t stop… until I got to Umea, Sweden about 9 days later. This entry was posted in Bicycle Touring Pro Articles, Darren Alff's Bike Tour Blog, Europe, Lifestyle, Locations, Norway, Photos and tagged ingeborg, island house, island house airbnb, island houses for rent, island in norway, island paradise in norway, kjartan, kjartan and ingeborg, norway island, norway islands, sula island, sula norway, summer house, travel norway, yellow house. I think you’ve done a wonderful job of capturing the beauty of the lovely home and the island … both with your words and your photos. Particularly enjoyed your description of trying to get some of your ‘action’ photos with the tripod and timer 🙂 What wonderful memories you have! I look forward to you being back on your bike and sharing your travel stories and photos in Central America. Have a nice rest at home in the US. Amazing article and I totally relate to that sense of sedantary solitude in a house alone. Best of luck on future travels. This norway island is really a paradise. I hope one day when I retire, I can have such a quiet place to live. Maybe It is a dream.